The following chapter has been contributed by the authors, John McGarry and Brendan O'Leary , with the permission of the publishers, The Blackstaff Press. The views expressed in this chapter do not necessarily reflect the views of the members of the CAIN Project. The CAIN Project would welcome other material which meets our guidelines for contributions. This publication is copyright John McGarry and Brendan O'Leary (1999) and is included on the CAIN site by permission of Blackstaff Press and the authors. You may not edit, adapt, or redistribute changed versions of this for other than your personal use without express written permission. Redistribution for commercial purposes is not permitted. Police reform, one of the most hotly debated issues in Northern Ireland, is at the heart of the Good Friday Agreement. This timely and refreshingly dispassionate book examines the status quo and puts forward reasoned proposals to help create representative, impartial, decentralised, demilitarised and democratically accountable policing services - proposals which respect the identities and ideas of unionists, nationalists and others. The authors, acclaimed commentators on Northern Ireland, address the tough questions: how to make the police representative of Northern Ireland’s population, in national allegiance, religious origin, and gender; how to reconcile the need for ‘downsizing’ with the need for new recruits; how to deal with symbolically divisive titles, uniforms and working environments; how to combine decentralisation, democratic accountability and operational autonomy; and how to demilitarise policing. Clear-headed and incisive, this book is essential reading for anyone interested in the policing of a historically divided territory and the full and fair implementation of the Good Friday Agreement. Who should be in the police? JOHN McGARRY was born in Belfast, Northern Ireland. He grew up in Ballymena County Antrim. He was educated at St MacNissi’s College, Garron Tower, County Antrim, Trinity College Dublin and at the University of Western Ontario, Canada. He was a Professor and Head of the Department of Polities at King’s College, University of Western Ontario (1989-98), and is now Professor of Political Science at the University of Waterloo, Canada. He is a specialist in national and ethnic conflict regulation, and a regular contributor to public media. BRENDAN O’LEARY was born in Cork, Ireland. He grew up in Nigeria, Northern Ireland and the Sudan. He was educated at St MacNissi’s College, Garron Tower, County Antrim, Oxford University and the LSE, where he is now Professor of Political Science and Head of the Department of Government. He has been a political adviser to Dr Marjorie Mowlam and Kevin McNamara, a constitutional consultant to the European Union and the United Nations, and is a regular broadcaster on British, Irish and American networks. The story in the above item from the Press Association’s wires is typical of many that we have read in the last three years. It encapsulates some of the difficulties that the public and policy-makers face in considering the reform of the police. The RUC has lost many officers at the hands of the IRA and that has naturally made it and its supporters fearful and hostile towards paramilitaries, especially republican paramilitaries. Many nationalists nevertheless remain equally fearful of and hostile towards the presence of RUC barracks, or RUC patrols, and these sentiments are most intensely felt in predominantly republican areas. The UK government’s security advisers, and the minister of state with special responsibility for security in Northern Ireland, Adam Ingram MP, just do not know whether they should rebuild destroyed barracks - to be prepared for any major breakdowns in the paramilitaries’ cease-fires - or whether they should radically scale down their building commitments - in preparation for a long and, with luck, permanent peace. And, if they do decide that new police stations are necessary, irrespective of the ‘security assessments’ they receive, policy-makers do not know what they should look like, or where they should be located. Should they be war-proof fortresses, or neighbourhood drop-in centres? Should they be built openly and accessibly in predominantly nationalist areas as a confident investment in a new era of cross-community co-operation, or should they be built in more secure and militarily critical locations, as deterrents to any future generation of would-be republican militants? What kind of policing should Northern Ireland have? Where should the boundaries of policing units be drawn? What mechanisms should be used to hold the police to account? This chapter addresses the first question. Its issue is the composition of the police. Our answer to this question is simple but in two parts: the police should be representative, and there should be just enough of them. The police should, as far as possible, be representative of all the minorities in Northern Ireland: unionists (of the ‘yes’ and ‘no’ persuasions), nationalists and others; and of Protestants, Catholics, agnostics, atheists and those of other religious faiths; and of the majority as well as the minority in Northern Ireland, that is, women and men. Above all, the police must be nationally representative. This criterion is the most important benchmark for change. The police should be representative of the region’s diverse religious believers and non-believers, and of men and women, whether in front-line policing or in back-up administration, but national representative-ness is vital for political stability. The second part of our answer to the question is that there should not be too many police. Lightly policed peoples, like lightly governed peoples, are less likely to resist the authorities and are more likely to support their necessary activities. Lightly numbered police services are obliged to rely more on their interpersonal skills at street level than on their brute coercive powers; they have stronger incentives to stay within the rule of law, and to use their discretion carefully and sensitively, than do their counterparts in heavily numbered gendarmeries. Light-sizing is another reasonable benchmark for change, though we believe that, initially, it must be weighted less heavily than the need for representativeness. Consider the RUC in the light of these two benchmarks. The most palpable fact is that nationalists and Catholics are extremely under-represented. While cultural Catholics make up around 43 per cent of Northern Ireland’s population, they comprise merely 7.5 per cent of total RUC personnel (or 968 of 12,819 officers). The current Catholic share is lower than at any time before 1969, even though the RUC has expanded threefold in size since then. Catholics are not ouly much less likely to be police officers than Protestants, they are also much less likely tojoin the police than minority groups in other democratic countries with histories of poor ethnic and communal relations. In 1983 blacks in the USA constituted 13.1 per cent of police officers, roughly their proportion of the population. The Catholic proportion of RUC officers is, on the other hand, only about one sixth of the Catholic share of Northern Ireland’s population. We have no data on the political opinions of police officers but suspect that voters for the SDLP are even less conspicuous than Catholics, and that Sinn Féin voters are likely to be rather isolated saboteurs. There are, in short, reasonable doubts about whether the small percentage of Catholic police officers can be considered, to paraphrase Nye Bevan, ‘authentic representatives’ of the Catholic community. Catholics who join the RUC either are or must become detached from the nationalist community. Alternatively, they are recruited from that small minority of the Catholic population that is not nationalist, or from Catholics who are not Northern Irish. Academic sources, including one sympathetic to the RUC, have noted that Catholic officers display attitudes that deviate from mainstream views in the broader Catholic, let alone nationalist, community and are in fact closer to Protestant and unionist attitudes. Another academic has claimed that RUC figures on Catholics are misleading as they appear to include those recruited from outside Northern Ireland, including from Britain. The RUC insists, by contrast, that it arrives at its figures by examining the Northern Irish schools attended by its members, and that recruits from outside Northern Ireland are not classified in the religious breakdown. But even if all Catholics in the RUC are Northern Irish Catholics, and even if they are all secret admirers of Seamus Mallon, the composition of the force simply does not meet the benchmark for political representativeness. Moreover, we must always remember that Catholic and nationalist under-representation is not, of course, limited to the core police itself, but extends into the civilian Police Authority which employs 3,500 workers. We are informed that roughly 3,000, or 85 per cent, of these workers are Protestants. The police service is also fundamentally unrepresentative of Northern Ireland’s population in its sexual ratios. Women outnumber men in the population but constitute 12.6 per cent of the RUC overall, and 10.8 per cent of RUC regulars (i.e., non-reservists). The under-representation of women in the police, while objectionable, is not atypical when compared with other countries, and it is not a critically important factor in heating local political divisions, which occur along national and cultural axes. But the sexual ratios of police personnel are relevant to resolving the main politically heated problem of representativeness. As nationalists and Catholics include a demographically predictable share of women (just over 50 per cent), any redress of the sexual imbalance, if handled correctly, would impact positively on the national and religious disparities. If the current police were to be restructured so that 50 per cent were men and 50 per cent were women, and if the new female recruits were drawn proportionately from cultural Catholics and cultural Protestants (43/57), the proportion of Catholics in the RUC would increase from 7.5 per cent to 23.6 per cent. Indeed, arguing that reforms are needed, at least partly, to correct the existing sexual imbalance has political advantages, as these would benefit Protestant as well as Catholic women, and would therefore be less divisive than the reforms that necessarily have to focus on the national and religious imbalance. The second benchmark is also decisively failed by the contemporary RUC. It has too many members - especially if the paramilitary cease-fires become permanent and there is no return to large- scale violence. Civil libertarians and governmental cost-cutters alike correctly charge that Northern Ireland is over-policed, and have jointly called for ‘downsizing’. As of November 1997, the RUC had 11,412 full-time officers as well as 1,407 part-timers. The current full-time complement is therefore over three times the number in place at the outset of the conflict, and over three times the number of a comparable English or Scottish region (see Figure 3.1). As we have seen, there is no widespread agreement on how these problems of RUC unrepresentativeness and size should be resolved, or, indeed, on whether they are problems. Some have suggested that if there is a significant reduction in the scale of political violence the number of police officers will need to be reduced to around 4,000-4,500, while others accept a slightly higher range of 4,600-5,700. The RUC, and Her Majesty’s Inspector of Constabulary, have argued that the service needs to retain somewhere between 6,000 and 8,000 officers. Their reasoning is based on the plausible assumption that Northern Ireland will continue to have problems that similarly sized English counties do not have, but also upon the more questionable argument that, unlike its British counterparts, the RUC finds it difficult to get assistance from other police services in times of need. Size is connected with representativeness. The more police jobs there are, the easier it will be to increase the proportion of Catholic and nationalist officers without disadvantaging serving Protestant officers. Just as it was once considered necessary to allocate considerable resources to policing to stop violence, it may now be argued that considerable resources are needed to consolidate the peace process. We are willing to accept that argument in return for meaningful changes in the composition and nature of the police. On this basis we are prepared to accept the top figure suggested by the Chief Constable, 8,000 officers overall, at least for the next two decades. Downsizing the RUC by about one third, from 11,412 to 8,000 full-time officers (that is, a reduction of 3,412 positions), is a relatively easy task. Even if downsizing by attrition should be ruled out, because we respect the argument that the police need to regenerate themselves through continuing youthful recruitment, most of the cuts (2,939 of the 3,412 positions) could be achieved simply by eliminating the full-time RUC Reserve - whose members, unlike regulars, are on three-year contracts. This proposal might be considered too blunt because it would not, for instance, allow qualifications to be taken into account. If that argument is accepted, policy-makers could selectively eliminate positions in the Reserve while also refusing to allow police officers to continue beyond the age of compulsory retirement - in 1997, 372 were exempted from retirement at the normal age. By itself, however, downsizing would not be likely to alter significantly the current religious and national imbalance. It is this particular personnel problem that generates the most controversy and needs greatest attention by the Patten Commission and the Secretary of State. We recognise that not everyone accepts that a representative police service is a priority. One common view, especially held among unionists of goodwill, is that a representative police service is much less important than one that acts impartially. The Workers’ Party, which takes this perspective, has argued that emphasising a ‘representative’ police service is harmful, because it involves an emphasis on group differences rather than on individualism, which is not an argument one might expect from what is an allegedly Marxist and collectivist party. Those who share this position think that to allocate police positions on the basis of nationality, religion or ethnicity would entrench such differences when the public policy goal should be to eliminate them. This reasoning is either wilfully or wishfully unrealistic. Managing differences equally is often more effective and equitable than artificially eliminating them. A police service composed primarily of recruits from the dominant ethnic or national group will not be seen as impartial by members of excluded groups, irrespective of the behaviour of police officers. Such a service is also unlikely to be impartial in practice, as its officers are more likely to reflect the values of their own community of origin, and not those of others. The key debate in policing reform should not therefore be over whether the police should be made more representative, but rather over how much more representative they should be. Significant numbers of unionists and nationalists believe there should be more Catholic officers. The major debate centres on the amount of change that is needed, and the period for achieving it. The position of the RUC and the Police Authority for Northern Ireland is that the application rate from the Catholic community should be increased so that it approaches the Catholic proportion of the population. In its 1997/8 report, the Police Authority signalled that it remained committed ‘to the goal of attaining’ a Catholic ‘application rate of 35 per cent’. To achieve more applications from Catholics, the RUC and the Police Authority cite the need for continuing cease-fires and political agreement, pointing out that the proportion of Catholic applications to the RUC nearly doubled from 11.7 per cent in 1993 to 20.3 per cent in 1995, after the IRA cease-fire of August 1994. They also argue for the promotion of lawful affirmative action measures - such as gearing advertisements towards the minority - for equality of opportunity, and for the promotion of a neutral working environment. Achieving a 35 per cent Catholic application rate will not be easy. The rate for 1997, the latest year for which figures are available, and during which the IRA renewed its cease-fire (albeit in July), was only 14 per cent. But let us accept, for the sake of argument, that through some means the Police Authority became successful in achieving its stated target of a 35 per cent Catholic application rate. This success, be it noted, would not necessarily translate into a 35 per cent Catholic recruitment rate. In fact, in most recent years Catholic applicants have been less likely to be hired than Protestants (see Table 3.1), contrary to the popular view that Catholic applicants to the RUC possess a ‘green card’ to a job in the police. Moreover, given current hiring levels (roughly 200 vacancies per year), even a 35 per cent Catholic recruitment rate will not produce a police service that is 35 per cent Catholic until around the year 2026 (see Figure 3.2). And, be it noted and underlined, even a 35 per cent Catholic police force would still mean that cultural Catholics, around 43 per cent of the population, were under-represented, and this under-representation is likely to become more obvious if, as seems likely, the cultural Catholic proportion of the population continues to grow. Source: Northern Ireland Affairs Committee, Composition, Recruitment and Training of the RUC, Vol. II (London: Stationery Office, 1998), Appendix B, p.14. Notes: *Wastage is not defined by the RUC. N/a = Not available. All percentage figures are rounded to one decimal place. Source: Northern Ireland Affairs Committee, Composition, Recruitment and Training of the RUC, Vol. II (London: Stationery Office, 1998), Appendix B, p. 14. Notes: *Wastage is not defined by the RUC. N/a = Not available. All percentage figures are rounded to one decimal place. 1994 entries for the RUC full-time Reserve are left blank and unexplained in the report. Source: As in Table 3.1, p.16. Catholics disproportionately during this transition period. A 93 per cent Catholic hiring rate during the transition would produce a police service that is 40 per cent Catholic, and roughly representative of Northern Ireland’s population. This twin-track strategy could and should be managed in such a way that it increases the representation of other under-represented groups, such as loyalists from working-class backgrounds, and, of course, women. A large and reasonably quick induction of Catholic officers along the lines suggested here would increase Catholic confidence in the police tremendously. It would also make it easier for many Catholics to contemplate joining the police, as their behaviour would be in line with significant numbers of their community in their age range. And finally, such a rapid induction is essential to the changing of the internal culture of the police. Small inductions of Catholics, particularly over a protracted period, would run the risk that such recruits would take on the force’s existing culture, as has happened until now in Northern Ireland, and has happened in US or British police services, when small numbers of blacks were introduced into largely white police services. Such a transition would create opposition within the unionist community. However, the UK government would be in a position to explain, correctly, that police numbers are being maintained at higher levels than strictly necessary in order to facilitate representativeness, and that the alternative to this strategy is a smaller police service - in which similar numbers of Protestant positions would be lost anyway. Unionist opposition may also be minimised if the UK government acts generously towards police retirees, and if it is made clear that the new appointments are not merely necessary for winning nationalist support for the new police, but also wholly justified, as we shall maintain, on efficiency and merit grounds. An important task for the UK government in managing the transition to a representative police force will be to minimise the impact on those officers who are released. The government’s first step should be to stop renewing the three-year contracts of members of the RUC Reserve. Most of the Reserve should be released over a three-year period, while particularly deserving members should be allowed to transfer into the regular police service. Generous severance packages linked to years of service should be paid. The elimination of the Reserve, assuming 400 transfers to the regular police, would achieve around 2,500 of the needed cuts. During the four-year transition period, around 800 police officers could be expected to retire. This would mean that a further 3,100 officers would have to be released if the number of currently serving officers was to be reduced to 5,000. This further downsizing should be achieved in the first instance, by generous and voluntary early-retirement packages. Such packages formed an essential part of transitional policing arrangements in South Africa, and the UK government has already indicated that it will approach downsizing with ‘sensitivity and generosity’. Nor should the government’s incentive package be limited to cash payments: it must examine ways of retraining police officers for productive jobs in other sectors of the economy. Providing the UK government is generous, these incentives should be enough to achieve the necessary reductions. If they are not, the balance will have to be achieved through redundancies. These would have to be designed to avoid the normal crude ‘last in, first out’ practice. Officers who have disciplinary records, or who have not responded well to the police’s training programme in community awareness, should be considered more eligible for redundancies than others. Officers made redundant should be eligible for any job-retraining programmes. Some of them, though probably not a large number, could be offered positions in other police services in the UK that have vacancies. It might also be possible for some officers to move from full-time to part-time status, as is already possible under 1996 legislation. It is difficult to be precise about the costs involved in downsizing the police along the lines we are suggesting here. The earlyretirement and severance packages that are offered to each individual would vary depending on service and rank. However, if we assume that an average of £50,000 per individual was required, and that 5,600 payments would be made (6,400 cuts minus 800 normal retirements), the total cost to the Exchequer would be £280 million, presumably phased. While this is a considerable sum, it represents less than two thirds (64 per cent) of the full-time RUC’s annual salary bill of £439 million. As the annual total police salary bill would be reduced by roughly 30 per cent as a result of downsizing from 11,412 officers to 8,000, the cost of the early retirement! redundancy packages would be recouped in just over two years from savings on salary. In any case, since some such transition is necessary for peace, and as peace will have some advantages for the Exchequer, it would be wrong to focus on the short-term economic costs. reduce the significant employment gap between Catholics and Protestants. It could also be argued that any deviation from individual equality of opportunity to equality of result would be temporary in nature, and would have to last only so long as is necessary to correct the current imbalance in police personnel. After that, the police would have to rely on difference-blind hiring policies. We believe that if no other way can be found to create a representative police service, positive discrimination is something the UK government will have to consider. Positive discrimination, however, is illegal under the Fair Employment Act (1989). While this act, like any other, could be amended by parliament, the current government remains committed to recruitment on grounds of merit. There is also strong general support for the merit principle in both communities. Unionists of all stripes would be likely to protest strongly at positive discrimination, and Catholic or nationalist recruits who were hired because of positive discrimination, and even those who were not, might well feel stigmatised. Even the Labour MP Ken Living-stone, a stout defender of northern nationalists, has argued that positive discrimination in the police would be ‘totally counterproductive’ and that ‘people have to be advanced on merit’. In this context the UK government will no doubt, at least in the first instance, seek to ensure that all new hiring is done in conformity with the merit principle. This need not mean accepting, however, the narrow description of merit that forms the basis of current hiring practices. The Patten Commission and the UK government should argue instead that as effective policing requires strong links between the police and the people they serve, and as it is impossible to create these if the police are overwhelmingly from one community, so more Catholics, especially nationalist Catholics, are needed on efficiency grounds. Part of the reason why more unionists than nationalists trust the RUC, and why more intelligence is forthcoming from loyalist than from republican areas, is that the RUC is overwhelmingly Protestant. The RUC’s first Inspector-General recognised this in the early l920s: ‘It is quite useless to expect to obtain any information from the RC areas unless there are RC police and detectives. The efficiency of the force suffers at present from a lack of RC police. Membership of, and familiarity with the norms and culture of, the nationalist community should be considered a criterion of merit in any rational public administration in Northern Ireland, something to be taken into consideration along with other criteria during the hiring process. If nationalists can be encouraged to apply to be police officers, and if there is recognition that they possess a resource the police currently lack and need, then the disproportionate hiring of nationalists is required on meritorious grounds for the tasks in hand (unless one assumes that nationalists are less intelligent or, on average, substantially less educated than unionists in ways that would impair their performance as police officers). Another way to achieve the same result, while still conforming with merit criteria, would be for the UK government to insist that new recruits should come from or reside in the locality that they police, and that all regions of Northern Ireland should be fairly represented in the police service. In this case, the policing authorities would justify their decisions on the grounds that it is essential for a police officer to be familiar with the territory being policed, and that if ‘community policing’ is to take root, it should be conducted by officers either indigenous to or now living in (or even willing to live in) the relevant districts. As most nationalist (and most loyalist) communities are currently policed by officers who live far outside the policing area, the effect of such a new recruitment policy would be to create openings for those living or prepared to live in such areas. The ‘core skills’ identified by the RUC as required in a police officer do not at present include knowledge either of the nationalist or unionist community or of many localities in Northern Ireland - something that can rapidly be remedied. A third way to increase the proportion of nationalists, without resorting to discrimination on the basis of religious social origins, is to require the police to consider specific educational qualifications, including courses and diplomas in policing, during hiring. Prerecruitment educational programmes could then be targeted at areas of social need, which are disproportionately nationalist. If government grants for undertaking such programmes were limited to those who were unemployed, for example, Catholic males should benefit at twice the rate of Protestant males, given that these are their comparative positions in the labour market. While the privileging of Catholics as Catholics is illegal under the Fair Employment Act, it is permissible to target areas and classes. So far, we have discussed the religious and national imbalance in the RUC at an aggregate level, and have avoided commenting on differential imbalances within the policing hierarchy. Catholics are slightly better represented in senior ranks than at the rank of constable, comprising 10 per cent of inspectors and chief inspectors (64 of 643), 17 per cent of superintendents and chief superintendents (27 of 160), and 11 per cent of assistant chief constables (1 of 9). However, Catholics remain strikingly under-represented in even these ranks when compared to their share of the population, male or female, or the population of working age. Even if more Catholics are recruited into the police service at junior levels, there will continue to be a serious imbalance at senior levels. One way for the UK government to address this difficulty rapidly would be to consider lateral transfers from other executive-level positions into the senior ranks of the police. Some senior jobs - for example, in the community relations, forensics or personnel departments - do not require a specific background in the police, and could be filled effectively by those with suitable credentials earned elsewhere. The government could also consider the secondment of senior officers from the Garda Siochàna, and it could seek proactively to recruit senior Garda Siochàna officers to permanent jobs, until there are enough senior officers from nationalist communities in Northern Ireland. One thorny question about recruitment is whether ex-paramilitaries should be eligible for police membership. Precedents for recruiting ex-paramilitaries formerly opposed to the state, or formerly engaged in civil wars, into the police and armed services exist in a range of countries, including South Africa and El Salvador. After the partition of Ireland, the RUC and the Garda Siochàna received significant influxes from the UVF and IRA respectively. In the case of the Garda Siochàna, the experiment eventually involved the successful integration of some former members of groups that had been engaged in a bitter civil war. Recruiting ex-paramilitaries into the police provides them with jobs and gives them a material stake in the new political arrangements. There are also clear advantages to operating a general policy of inclusiveness when trying to reach a durable peace after decades of conflict. Nevertheless, certain abuses of human rights should render individuals (whether ex-paramilitary, or ex-military, or ex-police) ineligible for membership in a police service. Extending eligibility to people irrespective of their past actions would strain the credibility of the new police, and would be seized on by those who are opposed to change, and who want to prevent the acceptance of the reforms advocated here. Our position, and that of several other commentators, is that former membership in a paramilitary organisation should not itself render an individual ineligible for police membership, although the commission of serious crimes, especially crimes against persons, should.44 There should be no double standard here: police officers convicted of human rights abuses or scheduled offences against persons should also not be eligible to be re-recruited into the police or the armed services. Allowing former paramilitaries to join the police is not the same as handing over the policing of certain areas to paramilitary organisations, as opponents of the proposal fear - and scaremongers suggest - will happen. Police membership must be incompatible with paramilitary membership, whether of organisations that have cease-fires or not. Nor would the presence of former paramilitaries mean that the police should be allowed to administer punishments without due legal process. All police, including those operating in republican and loyalist strongholds, would have to be under the control of, and accountable to, duly constituted political and legal authorities. Constructing a representative police should bring a number of benefits. It will increase nationalist confidence that the police service(s) represent(s) everybody. It will erode the partisan unionist culture in the current police force in a more effective way than can ever be done by the RUC’s provision of ‘cultural awareness’ training for Protestant officers. By making available a number of high-paying jobs for nationalists, it will also go some way towards meeting the government’s goal of eroding the unemployment gap, and the comparative income gap, between Protestants and Catholics. By enhancing nationalist support for legitimate policing, and for the new political status quo, such change will also benefit the unionist community. As the leaders of the UUP have realised, the long-term future of the Union will be better secured if it can be demonstrated to nationalists that it works in a manner that is fair and just. Unionists should also appreciate that a representative police force will be a more effective police force, as it will have more effective communication with the nationalist community than the RUC has ever enjoyed. Loyalists, as well as nationalists and republicans, could be expected to gain from some of the changes recommended here. That is not to say that change will be painless or costless. There will be some long-term economic costs for the unionist community from downsizing police numbers, but many of these costs are an unavoidable consequence of the transition to peace. In the short term, these costs will be offset considerably if the government is generous in providing compensation and retraining. The creation of police job openings for Catholics, however, will not be enough to produce a dramatic increase in Catholic applications. Northern Catholics are not like racial minorities in the United States and elsewhere who are (or have been) under-represented because of discriminatory hiring practices. Catholics are also underrepresented in the RUC because they consider it a nationally unacceptable police force, and do not apply to join it. Creating a representative police service therefore requires changes that make the police more acceptable to nationalists as well as policies that ease the hiring of Catholics. Such changes must be directed towards creating a nationally impartial policing service and towards enhancing local and democratic control over policing by the communities being policed. These objectives are discussed in the next three chapters. Anarchists might insist on a prior ‘why question: ‘Why have a police at all?’ They think that that government is good which governs least, and hence that no government is best of all. Our answer to anarchists is modernist, statist and realist. Ireland and Britain arc post-tribal and post- agrarian. Modernist and statist peoples just do not and should not leave policing to the doubtful and arbitrary merits of self-help and feuding. They rightly treat policing services, or their functional equivalents, as necessary instruments for protecting people and their rights, including their personal security and property rights. This is, of course, compatible with considerable variation in the nature and accountability of policing services. The anarchist’s only feasible alternative to policing is a regime in which everybody acts as their own paramilitary, or hires others for ‘protection’, a regime that we suspect most Northern Irish people would reject. See John Brewer, Adrian Guelke, Ian Hume, Edward MoxonBrowne and Rick Wilford, The Police, Public Order and the State: Policing in Great Britain, Northern Ireland, the Irish Repnblic, the USA, Israel, South Africa and China (New York: St Martin’s Press. 1988), p.112. The ethnographic study of Brewer and Magee found that Catholic officers, in an effort to fit into the RUC, displayed attitudes similar to the dominant Protestant/unionist culture within the force. They say that some of the most blatantly anti-Catholic remarks they heard were uttered by Catholic policemen. John Brewer with Kathleen Magee, Inside the RUC: Routine Policing in a Divided Society (Oxford: Clarendon Press, 1991), p. 250. A study of part-time members of the RUC produced similar findings; see R. Mapstone, ‘The attitudes of police in a divided society’, British Journal of Criminology, 32, 2 (1992): pp. 183-92. Graham Ellison makes the claim in a memorandum to the Northern Ireland Affairs Committee. Sec Composition, Recruitment and Training of the RUC, p. 267. Ellis on does not produce figures, but acknowledges that the numbers of non-Northern Irish Catholics are likely to be small. Vigorous advertising and recruitment among Catholics in the Republic of Ireland could, of course, change that. In 1969, the RUC had 3,044 members. SecJohn Brewer et al., The Police, Public Order and the State, p. 56. The lower range is from Paul Bew, Henry Patterson and Paul Teague, Northern Ireland: Between War and Peace (London: Lawrence and Wishart, 1997), p. 102. The higher range is from the Committee for the Administration of Justice, A Submission from the Conimitteefor the Administration ofJustice (CAJ) to the Police Authority (PANI) Consultation on the Future of Policing in Northern Ireland (Belfast: CAJ, August 1995), p. 17. In evidence to the Northern Ireland Affairs Committee, the Chief Constable suggested that the figure would have to be something in the order of less than 8,000 officers overall’. 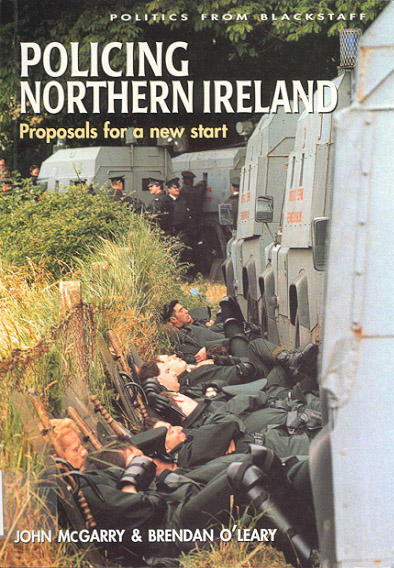 Northern Ireland Affairs Committee, Composition, Recruitment and Training of the RUC, p.29. The Police Authority reports the Chief Constable and Her Majesty’s Inspector of Constabulary opting for ‘around 6,000-7,000 officers’. Police Authority for Northern Ireland, Listening to the Community, Working with the RUC (Belfast: PANI, 1998), p. 52. The temporary transfer of police from English and Scottish services is not an insuperable problem, and the British government could address this problem, in a new era of North-South co-operation, by allowing the police in Northern Ireland to call for assistance from the Garda Siochàna, a police service with which, in the Chief Constable’s view, the RUC enjoys excellent relations (Northern Ireland Affairs Committee, Composition, Recruitment and Training of the RUC, p.41). Such a policy would meet the terms of reference of the Patten Commission (see Appendix A to this book, pp. 115-19). Bob Cooper of the Fair Employment Commission (FEC) also favours a larger force than could be justified for law-and-order needs, on the basis that it would provide more jobs for Catholics. ‘RUC needs more Catholics says FEC’, Irish News, Belfast, 26 March 1998. The FEC argues that a fixed proportion of police jobs should go to Catholics and that the law should be changed to permit this target. Northern Ireland Affairs Committee, Composition, Recruitment and Training of the RUC, p. 282. By contrast Ivan Topping, a law lecturer at the University of Ulster, argues that it would be easier to obtain a representative police if its numbers were small - presumably because the smaller the total of police the easier it would be to recruit a proportionate number of nationalists. This is true but neglects the interests of serving officers. Ibid., p. 240. Workers’ Party spokesperson Paddy Lynn maintains, ‘People have to stop thinking on the lines of Catholics or Protestants in the police but start thinking along the lines of a service based not on religious quotas but on merit. While there is recognition that there has to be changes within the structures of the RUC, religious head counts are not the answer. What we want, and what the people of Northern Ireland need, is a police service that is accountable, impartial, independent, effective, responsive, professional, unarmed and civilianised.’ ‘Authority unveils policing proposals’, Irish News, Belfast, 26 March 1998. PANI, Listening to the Community, p.63. A recent Times editorial claimed that ‘after the IRA called its cease- fire the proportion of applicants from the Catholic community for jobs with the RUC rose to over 30 per cent of the total, strikingly close to the sectarian balance in the Province’. ‘An open and shut case’, Times, London, 29 April 1998. This is unimpressive reporting, and suggests editorialising with factual insecurity: (1) the figures referred to applicants and not successful recruits, and Catholics are more likely to be the former than the latter; (2) the actual proportionate increase in applications was to 20 per cent, nor 30 per cent, an error of magnitude of 50 per cent; and (3) 30 per cent is not ‘strikingly close’ to the religious balance -cultural Catholics represent over 43 per cent of the population, which is a considerable distance from 30, never mind 20 per cent. Northern Ireland Affairs Committee, Composition, Recruitment and Training of the RUC, p. 30. Apart from deflating the ‘green card’ myth, these figures throw into question the RUC’S claim that an applicant’s religion ‘will have no bearing on whether [s/he is] successful during our selection procedures’. Northern Ireland Affairs Committee, Composition, Recruitment and Training of the RUC, p. 15. In 1995, often cited as a banner year because of the increase in the Catholic application rate to 20 per cent, 44 Catholic officers were recruited into a force of 12,819. Ibid., P. 14. Our figures arc based on the RUC’s current full-time complement of 11,412 police officers. We have assumed that serving Catholic officers will retire or be made redundant at the same rare as Protestant officers. Reducing overall police numbers from 11,412 to 5,000, therefore, would reduce the number of serving Catholic officers from 900 to 394. Women constitute just over 10 per cent of the current police, and are disproportionately concentrated in the lower ranks: 17 per cent of constables, 4 per cent of inspectors, and 2.5 per cent of superintendents are female. See Mary O’Rawc and Linda Moore, Human Rights on Duty: Principlesfor Better Policing - International Lessons for Northern Ireland (Belfast: GAJ, 1997), pp. 24-fl. Increased numbers of females in the police service might help change its image and internal culture, making it seem less threatening to all, nor just nationalists. Trevor Jones and Tim Newburn, ‘Policing and disaffected communities’, in Standing Advisory Commission on Human Rights, Report for 1995-1996 (London: HMSO, 1996), pp. 257-8; Ronald Weitzer, Policing under Fire: Ethnic Conflict and Police-Community Relations in Northern Ireland (Albany: SUNY Press, 1995), pp. 109-10. Different assumptions will produce different results. Bew, Patterson and Teague have proposed a two-stage model which would reduce the size of the RUC from 11,500 (full-time) to 4,000-4,500 and make it representative of the population within seven years. In the first stage, which would take three years, they propose downsizing the RUC by 4,600 through eliminating the Reserve (3,100) and by ‘natural wastage’ (1,500). The three advocate a simultaneous ‘massive campaign to recruit Catholics’, with the objective being to recruit 1,000 Catholics. In the second, four-year stage, the RUC would be downsized by a further 4,000. At the end of the period, the RUC would be operating at its minimum efficient scale of 4,000-4,500 and would be broadly representative of the population. See Bew et al., Northern Ireland: Between War and Peace, p. 102. Their suggestions involve more job losses for Protestants and fewer job gains for Catholics than ours do - nor do Bew, Patterson and Teague explain why a ‘massive campaign to recruit Catholics’ into the RUC would succeed. We do not think that Catholics will join the police unless policing undergoes a number of necessary major changes, especially in national impartiality, that Bew, Patterson and Teague do nor address. This is based on the RUC’S figure that roughly 200 vacancies occur each year. 2,166 officers have served for more than twenty years. See Northern Ireland Affairs Committee, Composition, Recruitment and Training of the RUC, p. 18. Michael Brogden, ‘An agenda for post-Troubles policing in Northern Ireland: the South African precedent’, Liverpool Law Review, xvii (i), 1995, p. 25. 27 See the Discussion Paper, Principles for Policing in Northern Ireland (Belfast: Stationery Office, 1998), p. 5. Short Brothers of Belfast has recently won a Court case against the conventional union practice of ‘last in, first our’. There is a widespread view that younger RUC officers are more enlightened than their senior counterparts, which, if true, would suggest that redundancies should be based on a ‘first in, first our’ principle. This, as far as we know, has nor been rested. Survey data do nor suggest that among the general public the young are more enlightened in their attitudes than their elders. Anecdotal evidence also throws some doubt on the theory. Recently, an RUC trainee told a non-RUC instructor who was lecturing about human rights that the RUC would have solved ‘the problem’ a long time ago if it had not been for his sort. Another recruit told the lecturer that he ‘had no idea what it was like our there for an RUC officer’ - without explaining how he himself knew -interview with a Queen’s University lecturer, March 1998. One study describes younger police as being more aggressive than older mature officers; see A. Hamilton, L. Moore and T. Trimble, Policing a Divided Society: Issues and Perceptions in Northern Ireland (Coleraine: Centre for the Study of Conflict, 1995), p. 102. See Brogden, ‘An agenda for post-Troubles policing’, p. 25. Michael Brogden also suggests that RUC officers, who have gathered considerable skills in fighting subversives, should be able to find high-paying jobs in several other countries. As we are sure he would agree, however, the use of such expertise in any country would have to be carefully controlled. The figures are for 1997/8. See PANI, Listening to the Community, p. 59. Brewer et al., The Police, Public Order and the State, pp. 48-9. James Craig and Michael Collins also signed a pact that provided for the B Specials in Belfast to behalf Catholic and half Protestant, although this did not materialise. Weitzer, Policing under Fire, p.41. The last benefit has led Bob Cooper, Chair of the Fair Employment Commission, to call for more Catholics in the RUC. ‘RUC needs more Catholics says FEC’, Irish News, Belfast, 26 March 1998. Secretary of State Dr Mowlam wrote recently that ‘officers must continue to be recruited, appointed and promoted openly and fairly, in accordance with recognised standards of practice, based upon merit’. Belfast Telegraph, I May 1998. Northern Ireland Affairs Committee, Composition, Recruitment and Training of the RUC, p.31. Between 1 January 1994 and 20 February 1998, police arrested 2,372 loyalists compared to 1,463 republicans; and 42 loyalists and 24 republicans were charged with murder, Irish News, Belfast, 21 February 1998. This discrepancy is partly explained by the greater willingness of loyalist communities to give information to the RUC, and by the greater familiarity of the police with loyalist areas. It may also be the case, of course, that loyalists were involved in more offences during this period, and/or that they were less efficient or secretive than republican paramilitaries. Michael Farrell, Arming the Protestants (London: Pluto Press, 1983), p. 189. In the United States, for example, one of the central arguments both for quotas in public institutions and for the redistricting of electoral constituencies is that black constituents feel more comfortable, and are more likely to voice their concerns, if their representatives (and the agents of government) are black. See Jane Mansbridge, ‘A descriptive representation in communicative settings of distrust, uncrystallized interests, and historically denigrated status’, paper presented to a conference on Citizenship in Diverse Societies, Toronto, Ontario, 4-5 October 1997, pp.21-4. In the early 1990s, Bishop Edward Daly ofDerry complained that, to the best of his knowledge, there was not a single police officer living on the west bank of the Foyle. It’s a community of 80,000 people and not a single police officer living in that area.’ Cited in Hamilton et al., Policing a Divided Society, pp. 48-9. John Edwards, Affirmative Action in a Sectarian Society: Fair Employment Policy in Northern Ireland (Aldershot: Avebury, 1995), p. 15. PUP, Submission to the Northern Ireland Office by the Progressive Unionist Party on Policing and Related Matters (Belfast: PUP, 1995), p. 2. In the DUP’s view, this is evidence of a ‘green card’, that is, unfair promotion. As Ian Paisley puts it, ‘Roman Catholics in the police force have the best possible time. They move to the top posts because of their religion.’ House of Commons Hansard Debates, 15 December 1997, col. 83. (See also the comments by DUP deputy leader Peter Robinson, in Northern Ireland Affairs Committee, Composition, Recruitment and Training of the RUC, p. 35.) Given that Catholics constitute a smaller proportion of the police now (7.5 per cent) than they did in 1969 (10 per cent), it may be that Catholics are proportionally more senior than Protestants. More important, HM Inspector of Constabulary, Colin Smith, found that 30 per cent of Catholics who applied for promotion to sergeant were successful, compared with 28 per cent of Protestants - hardly definitive evidence for Dr Paisley’s beliefs. Since he also found that Catholics are considerably less likely to apply for promotion, the DUP’s case collapses. ‘Inspectorate reveals lack of Catholic applications’, Irish News, Belfast, 9 February 1998. The Imperial Grand Chapter of the British Commonwealth, in a memorandum submitted to the House of Commons, wrongly claims that the ‘higher ranks’ of the RUC are ‘about 40 per cent Catholic’. Northern Ireland Affairs Committee, Composition, Recruitment and Training of the RUC, p.227. See ORawe and Moore, Human Rights on Duty, p. 245. See ibid., p. 144; Brogden, ‘An agenda for post-Troubles policing’, p. 10; Kevin Boyle and Tom Hadden, Northern Ireland: The Choice (Harmondsworth: Penguin, 1994), p. 202; Colm Campbell, Policing in a New Society (Belfast: Centre for Research and Documentation, 1994), p. 8.